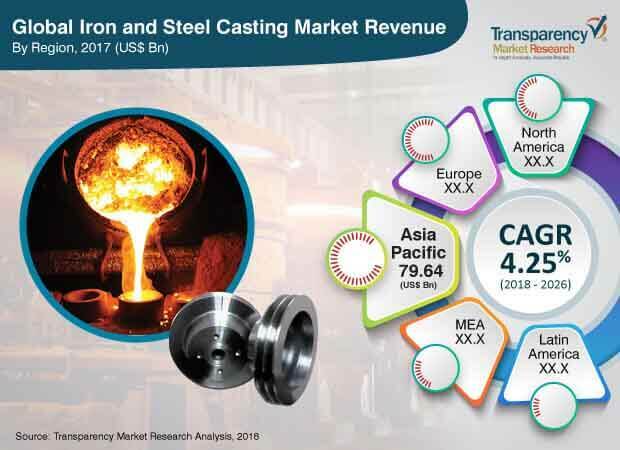 The global iron and steel casting market was valued at US$ 130 Bn in 2017 and is anticipated to expand at a CAGR of more than 4% from 2018 to 2026, according to a new report published by Transparency Market Research (TMR) titled ‘Iron and Steel Casting Market – Global Industry Analysis, Size, Share, Growth, Trends, and Forecast, 2018–2026.’ The iron and steel casting process involves production of any object of desired shape and size by pouring or injecting molten iron and steel into a mold. Such products are manufactured on a large scale for a wide range of sectors such as oil & gas, agriculture, automotive, power generation, industrial units, and manufacturing machinery. Growth of heavy industries such as automotive, mining, and construction is a major driver of the iron and steel casting market. Especially, rising demand from the construction industry is likely to propel the demand for iron and steel casting products in the near future. Construction equipment need to be sturdy, strong, and long-lasting. They need to incur low costs for maintenance and withstand varying pressures and different climatic conditions. This type of equipment also requires raw materials with excellent properties. Iron and steel are among the most commonly used raw materials in the manufacture of equipment for heavy industries such as power generation, manufacturing machinery, oil & gas, electricals, and industrial equipment. Traditionally, the mining industry has been an important end-user of iron and steel casting products. The industry is focused on reducing its operational costs. The low-maintenance and long-lasting nature of iron and steel casting products make them suitable for use in the mining industry. The automotive industry uses iron and steel casting products to offer sturdiness and strength to auto components and parts, so that they can withstand varying temperatures and possible vehicle accidents. Automotive manufacturers have shifted their focus toward cast aluminum instead of the conventional iron and steel products. They want to benefit from superior properties of aluminum casting products such as corrosion resistance, lightness, and high performance. These products can also help manufacturers meet the emission limits set by different regulatory bodies. Furthermore, use of aluminum can reduce the total weight of a vehicle by 10% to 15%. Use of aluminum is preferred in electric vehicles to reduce the vehicle weight. This, in turn, increases the durability of batteries. There are several other factors that drive the use of aluminum in the automotive sector. Increasing adoption of aluminum casting products acts as a restraint of the iron and steel casting market. Governments of developed countries such as Canada, the U.K., France, and the U.S. are planning to invest in the maintenance of infrastructure projects. On the other hand, governments of developing countries such as Brazil, South Africa, China, and India are planning to develop Greenfield projects. A few examples of such projects include the proposed bullet train in India; metro railways in several cities of India such as Pune and Nagpur; and the Belt and Road Initiative by China. Other countries such as Pakistan, Sri Lanka, Rwanda, and Tanzania are also planning to take initiative for such projects. Such projects require iron and steel casting products in large quantities, which increases the demand for iron and steel casting products. In terms of material, the global iron and steel casting market can be divided into gray iron, ductile iron, steel, and malleable iron. The gray iron segment holds the leading market share and is expected to maintain its dominance during the forecast period, due to low manufacturing cost, high tensile strength, ductility, and impact resistance of gray iron. Based on application, the market can be segregated into automotive & transport, pipes & fittings, pumps & valves, machinery & equipment, and others. Various properties of iron and steel such as ductility, durability, and impact resistance make them highly suitable for use in the automotive & transport sector. The automotive & transport segment accounts for the leading share of the market. In terms of region, the global iron and steel casting market can be classified into North America (the U.S. and Canada), Latin America (Brazil, Mexico, and Rest of Latin America), Europe (Germany, the U.K., France, Italy, Spain, Russia & CIS, and Rest of Europe), Asia Pacific (China, India, Japan, ASEAN, and Rest of Asia Pacific) and Middle East & Africa (GCC, South Africa, and Rest of Middle East & Africa). A large number of iron and steel casting companies operate in the market. These companies range from small and local manufacturers to medium-sized national-level companies and even, multinational companies. While large companies such as ArcelorMittal and Tata Steel account for a considerable share of the global market, the rest of the market is fragmented. The level of expertise of iron and steel casting companies is a significant factor affecting the competitive ability of market players. In terms of expertise and use of technology, multinational companies are better than small- and medium-sized companies. Some of the important companies in the market include Tata Steel Limited, Kobe Steel, Ltd., ArcelorMittal, Nucor Corporation, and Hitachi Metals Ltd.